The Joliet tungsten carbide wedding band is perfect for both men and women. The style in these tungsten carbide rings is slightly different from the classic flat design. The bevels give this tungsten ring a slight edge over other rings. This forces the band to appear slimmer than other rings. This tungsten carbide ring is forged with high quality tungsten carbide that is cobalt free. Most sizes ship within 1 business day. Free Lifetime Warranty and Lifetime Sizing; pay no restocking fees or deductibles! Ever since the beginning, the customer service was always very helpful all the way through the entire process. You send them an email and 10 minutes later, you get a response - this does not happen very often. This tungston ring is stunning and I have already recommended Tungston Rings Co to many friends. 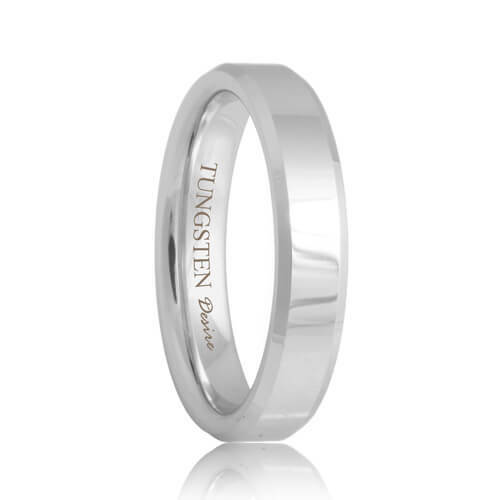 Tungston Rings Co is the best and most reliable way to buy a quality tungston band. The website has all of the answers you will ever need. I compared the prices and warranty policies with other stores and I just ran into more expensive and less informed sales people. I got straight answers from Tungston Rings Co that made sense. People always ask me how I could buy s wedding band online. I tell them, after doing all of the research; there is no other way to do it.